Sidewalk dining has spilled out into the street on N. Murray Ave. where two parking spots and a loading zone on the street have been sacrificed for use by customers of Two Bucks and Divino Wine & Dine restaurants. 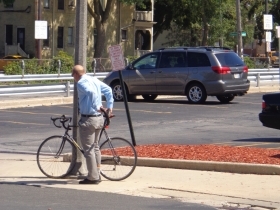 The “parklet” is Milwaukee’s first. More are expected to come, and legislation is expected to be drafted to codify their use, as has been done in San Francisco, said Ald. Nik Kovac, who spoke at a festive ribbon-cutting ceremony at noon Friday, August 23rd, 2013. The west side of Murray just north of E. North Ave. is a busy commercial street at a vital crossroads. But the sidewalk there was too narrow to comfortably cater to customers as well as pedestrians. The solution: lose a couple of parking spots, install a modular flooring system, throw a railing around the whole works and set the tables for the guests. 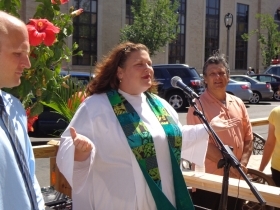 Plymouth Church Pastor Bridgette Flad blessed the parklet at the ribbon cutting. The project partners began working on the idea in March, said Two Bucks owner Lynn Forthaus, who collaborated with Dean Cannestra of Divino. 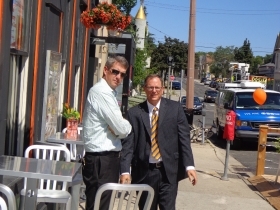 Building owner Mike Vitucci and East Side BID director Jim Plaisted worked out the details with Ald. Kovac, while Michael Loughran of the city handled coordination. The components were manufactured in Cedarburg by Streetdx. 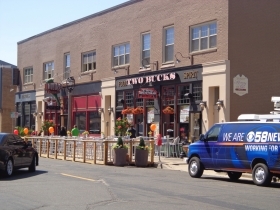 At the event, an orange ribbon was stretched across the Two Bucks seating area, while a red one festooned Divino. This little detail was one of many attended to by Andrea Rowe Richards, working for the BID and using skills honed from days in the Department of City Development. All television news stations made an appearance, which is an encouraging sign that will help expose more people to urban Milwaukee. 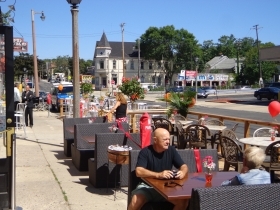 Cannestra offered an Italian buffet in his restaurant, and the audience helped itself to generous portions of salad, Italian beef, meatballs, ravioli and other specialties. He also put on a tour de force decapitation of a bottle of champagne, slicing it open with a large knife. The cork and a good portion of the bottle neck flew out to the middle of the street. He then poured the champagne from the truncated bottle, offering some to Betty Puccio, who thought it all was wonderful, including the weather. Rep. Jon Richards made an appearance, and hung out with his wife and son. He said he has not been approached for a job by Scott Walker, who seems to be casting about to remove Democrats from the legislature by offering them sinecures in his administration. That got some chuckles, since there is parking across the street and in the nearby huge garage associated with Columbia St. Mary’s hospital. The city got $1,000 to compensate for the lost parking meter revenue along with a $167 permit fee. 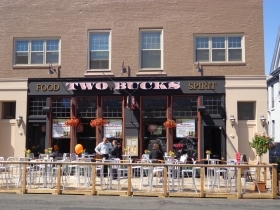 Depending on the weather, the city could recoup a good amount of that sum from its share of the increased sales tax collections arising from the net increased seating capacity of 43 for the two restaurants combined. “But that will depend on Rep. Richards making sure the state shares its revenue with us. They haven’t been very kind about that lately,” Kovac said. Department of City Development official and area resident Michael Maierle has filed an objection about the project and his belief that it will create sidewalk congestion with the City (in his capacity as a citizen). 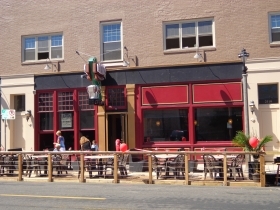 Maierle has routinely appeared in opposition to liquor license renewals for the E. North Avenue bars over the past few years.